Computers come in a variety of types designed for different purposes, with different capabilities and costs. A microcomputer is a computer that has a microprocessor chip (or multiple microprocessors) as its CPU. They are more commonly called personal computers because they are designed to be used by one person at a time. Personal computers are typically used at home, at school, or at a business. Popular uses for microcomputers include word processing, surfing the Web, sending and receiving e-mail, spreadsheet calculations, database management, editing photographs, creating graphics, and playing music or games. Desktop computers are larger and not meant to be portable. They usually sit in one place on a desk or table and are plugged into a wall outlet for power. The case of the computer holds the motherboard, drives, power supply, and expansion cards. This case may lay flat on the desk, or it may be a tower that stands vertically (on the desk or under it). The computer usually has a separate monitor (either a CRT or LCD) although some designs have a display built into the case. A separate keyboard and mouse allow the user to input data and commands. Notebook or laptop computers are small and lightweight enough to be carried around with the user. They run on battery power, but can also be plugged into a wall outlet. They typically have a built-in LCD display that folds down to protect the display when the computer is carried around. They also feature a built-in keyboard and some kind of built-in pointing device (such as a touch pad). While some laptops are less powerful than typical desktop machines, this is not true in all cases. Laptops, however, cost more than desktop units of equivalent processing power because the smaller components needed to build laptops are more expensive. 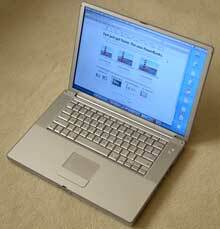 There are also less-powerful versions of notebook computers called subnotebooks, and netbooks that are used mainly to access the Internet. A Tablet Computer (often just called a tablet) generally has the format of a handheld slate consisting of a large LCD touchscreen used for both input and output. Tablets typically include a WiFi and/or cellular network data connection to access the Internet. Tablets run applications specifically designed for these touchscreen devices, but they also can do some activities such as word processing or spreadsheets, although the lack of a physical keyboard usually makes such activities more cumbersome on tablets than they are on desktop or notebook machines. 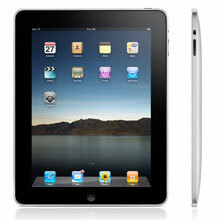 Examples of tablet computers include the Apple iPad and machines from various manufacturers that run the Android OS. Smartphones are high-end mobile phones that typically run operating systems similar to the tablet computers discussed above, so they often share the same applications as tablets. They combine the features of a mobile phone, PDA (see below), camera, music player, GPS device, etc. Many smartphones use a touchscreen for input, but some include physical keyboards. A Personal Digital Assistant (PDA) is a handheld microcomputer that trades off power for small size and greater portability. They typically use a touch-sensitive LCD screen for both output and input (the user draws characters and presses icons on the screen with a stylus). PDAs communicate with desktop computers and with each other either by cable connection, infrared (IR) beam, or radio waves. PDAs are normally used to keep track of appointment calendars, to-do lists, address books, and for taking notes. A palmtop or handheld PC is a very small microcomputer that also sacrifices power for small size and portability. These devices typically look more like a tiny laptop than a PDA, with a flip-up screen and small keyboard. They may use Windows CE or similar operating system for handheld devices. Some PDAs and palmtops contain wireless networking or cell phone devices so that users can check e-mail or surf the web on the move. A workstation is a powerful, high-end microcomputer. They contain one or more microprocessor CPUs. They may be used by a single-user for applications requiring more power than a typical PC (rendering complex graphics, or performing intensive scientific calculations). Alternately, workstation-class microcomputers may be used as server computers that supply files to client computers over a network or the Internet. This class of powerful microcomputers can also be used to handle the processing for many users simultaneously who are connected via terminals; in this respect, high-end workstations have essentially supplanted the role of minicomputers (see below). Note! The term “workstation” also has an alternate meaning: In networking, any client computer connected to the network that accesses server resources may be called a workstation. Such a network client workstation could be a personal computer or even a “workstation” as defined at the top of this section. Note: Dumb terminals are not considered to be network workstations (client workstations on the network are capable of running programs independently of the server, but a terminal is not capable of independent processing). There are classes of computers that are not microcomputers. These include supercomputers, mainframes, and minicomputers. A minicomputer is a multi-user computer that is less powerful than a mainframe. This class of computers became available in the 1960’s when large scale integrated circuits made it possible to build a computer much cheaper than the then existing mainframes (minicomputers cost around $100,000 instead of the $1,000,000 cost of a mainframe). The niche previously filled by the minicomputer has been largely taken over by high-end microcomputer workstations serving multiple users (see above). A mainframe computer is a large, powerful computer that handles the processing for many users simultaneously (up to several hundred users). The name mainframe originated after minicomputers appeared in the 1960’s to distinguish the larger systems from the smaller minicomputers. Users connect to the mainframe using terminals and submit their tasks for processing by the mainframe. A terminal is a device that has a screen and keyboard for input and output, but it does not do its own processing (they are also called dumb terminals since they can’t process data on their own). The processing power of the mainframe is time-shared between all of the users. (Note that a personal computer may be used to “emulate” a dumb terminal to connect to a mainframe or minicomputer; you run a program on the PC that pretends to be a dumb terminal). Mainframes typically cost several hundred thousand dollars. They are used in situations where a company wants the processing power and information storage in a centralized location. Mainframes are also now being used as high-capacity server computers for networks with many client workstations or for serving files over the Internet. A supercomputer is mainframe computer that has been optimized for speed and processing power. The most famous series of supercomputers were designed by the company founded and named after Seymour Cray. The Cray-1 was built in the 1976 and installed at Los Alamos National Laboratory. 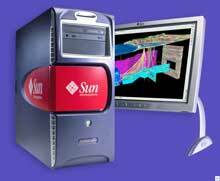 Supercomputers are used for extremely calculation-intensive tasks such simulating nuclear bomb detonations, aerodynamic flows, and global weather patterns. A supercomputer typically costs several million dollars. Recently, some supercomputers have been constructed by connecting together large numbers of individual processing units (in some cases, these processing units are standard microcomputer hardware). Please note: All of this talk of which computers are more powerful than others (i.e., mainframes are more powerful than minicomputers, which are more powerful than microcomputers) is relative for any particular moment in time. However, all classes of computers are becoming more powerful with time as technology improves. The microprocessor chip in a handheld calculator is more powerful than the ENIAC was, and your desktop computer has more processing power than the first supercomputers did. Computers are, in fact, all around you. Microprocessor chips are found in many electronic devices (in your iPod, in your DVD player, in your microwave, in your car, in your phone). These are special-purpose computers that run programs to control the equipment and optimize its performance. Copyright © 2004 by Thomas E. Beach, Ph.D.